We believe that oral history methodology and digital storytelling are appropriate methodologies for curricular-driven community engagement in small liberal arts colleges. In other words, we’re figuring out how to teach and learn by getting our students out of the classroom and into the community using an integrated toolkit drawn from interview methodology and the digital humanities. Eligibility: Open to full-time faculty interested in integrating oral history and digital storytelling into an approved course that will be offered twice in the academic year. The faculty member must involve students in interviewing, creating digital archives or multimedia stories, and community engagement. Timeline: Proposals due March 31, 2019. 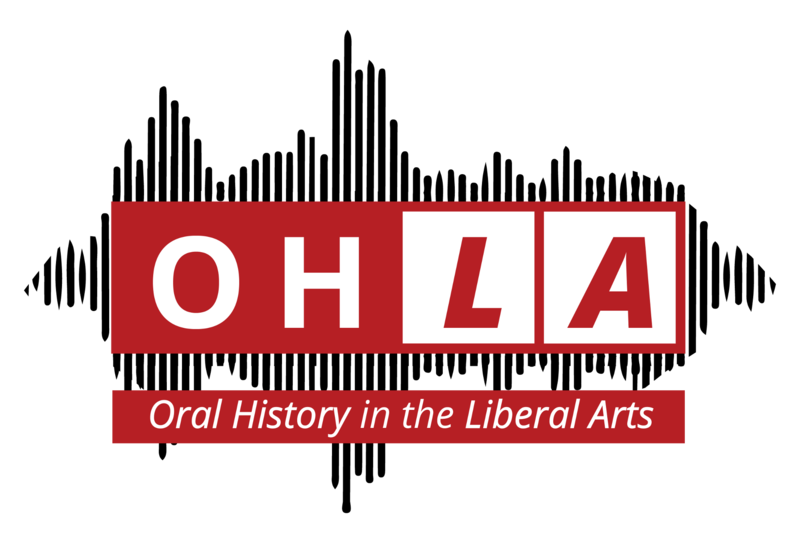 OHLA expects to fund 12 faculty fellows in the 2019-2020 school year. View CFP here. Funded faculty will articulate, gain campus approval for, and implement a digital humanities project that utilizes oral history driven by a curricular tie (a course on the books that you desire to teach in innovative and experiential ways). They will write at least 5 process-descriptive blog posts for an audience of curious faculty who are attempting similar pedagogical approaches, sharing your syllabus and any assorted materials, and writing a peer-reviewed case study summarizing the endeavor and your key decision points in conclusion. Eligibility: Must be a full time student with a GPA of 3.0 and junior or senior standing with the support of a full-time faculty member on their home campus. Timeline: Proposals due March 31, 2019. OHLA expects to fund 8 undergraduate fieldwork fellows in the 2019-2020 school year. View CFP here. This grant supports student-initiated and executed oral history projects— and the campus faculty mentor who agrees to sponsor it. The expectation for the undergraduate student is to articulate and gain campus approval for an independent oral history research project that involves interviewing, creating digital archives or multimedia stories, and community engagement. This student will undertake a full-time oral history project including planning, collection, processing, and archiving for the duration of a term of study at their institution. Awards provide a direct $3500 stipend to the student, a $1500 stipend to their sponsoring faculty member, and an allowance of $360 for customary and reasonable expenses of an oral history research project, such as travel for fieldwork or technology. Expectations of the sponsoring faculty mentor include overarching support and mentorship during the fieldwork period, to ensure timely completion of the project’s goals, and co-authorship of a summary case study highlighting decision points and successes. Together, the team will produce at least two process-oriented blog posts highlighting aspects of the project and approaches taken for an audience who is curious about project design and community engagement.